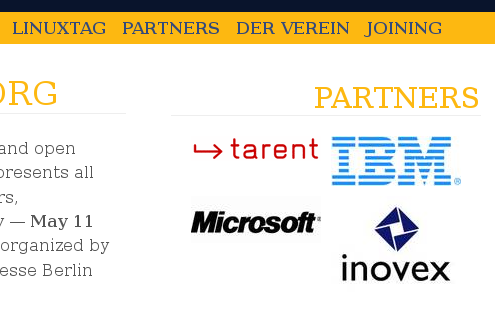 AFTER the deal with Novell Microsoft began paying not only FOSS conferences (usually with Novell as its entry ticket) but also Linux conferences, which has the effect we explained in the context of previous LinuxTag events [1, 2, 3]. Here is the page from which the above screenshot was extracted. We have pretty much covered the issue (Microsoft funding LinuxTag) on a handful of occasions before, so we need not elaborate again. To put it concisely, what we observe here is that Microsoft is still a major “Partner”, buying itself some talks to repel the pro-Linux crowd, thereby helping to distort reality and remove from the event any resistance to attendance by the company which is suing Linux from many directions and lobbying for software patents in Europe. Go with a pack of rotten tomatoes and throw them at the Micro$ofties. Do as the french did. They did it right. The goal is not to reject such events but to encourage organisers to reject Microsoft.